That morning, I took the train from Mostar to Sarajevo. The ticket cost me 10,9 KM. Bus would be a faster choice (around 2.5 hours) but the slightly longer 3.5 hours of train ride was much more tempting. 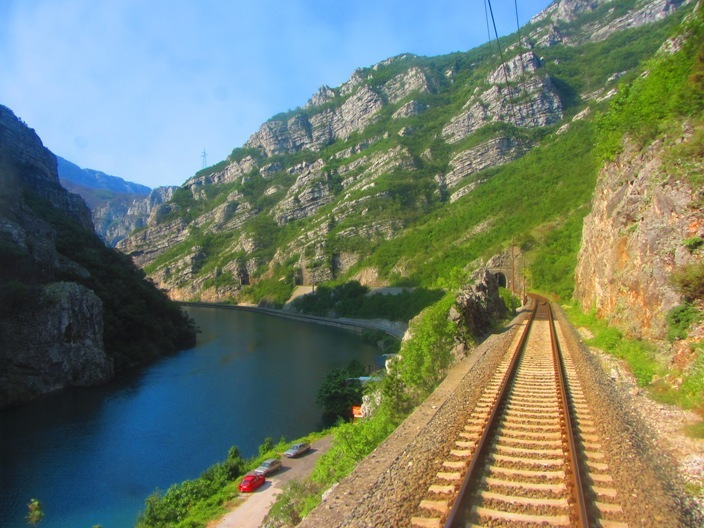 Not only trains are usually more comfortable than buses — you can walk around and stretch a bit from time to time; but the Mostar-Sarajevo train ride is dubbed as one of the most beautiful track in the world. There were only three or four carriages behind the locomotive, making it the shortest train series I’ve ever been. I entered one of the compartment where an Asian guy sat. I remember seeing him in the streets when I strolled around Mostar. I asked him to help me put my backpack on the upper rack, as I’m way too short to put it myself. Upon seeing my bag, while hoisting it up to the baggage rack, he immediately asked, “Indonesia?” He noticed the brand, which was Indonesian, because well, what else, he was an Indonesian too! Almost four hours passed us and we arrived at Sarajevo. The train station was a no-nonsense rectangular building styled a la socialist architecture, a remnant of the long-gone Yugoslavian years. Fadli and I took a tram to the city center (1.6 KM at the kiosk, or 1.8 KM from the driver — tickets must be validated). Do you know that Sarajevo has the first tram line in continental Europe? Apparently the then-rich and powerful Austro-Hungarian Empire built the tram line as a pilot project: if it hadn’t been successful, “only” subjects in the empire’s fringe would’ve got hurt; but if it had been successful, the system could’ve be used in the capital, Vienna. Good thing the tram line worked well. Fadli got off first while I went for more tram stops until I reached the one nearby my hostel, City Magic, located at the Marsala Tita street, named after – who else – the Josep Broz Tito. The hostel was clean and ok for EUR 9.2 per night. The city is more than the Yugoslavian war, of course. There are traces of years of Ottoman Turkey, Austro-Hungarian empire, and (short-lived peaceful time of) Yugoslavia. Ottoman architecture in the Old Town stood next to European 19th century style brought by Austro-Hungarian empire and strong lines and edges of Socialist era buildings. 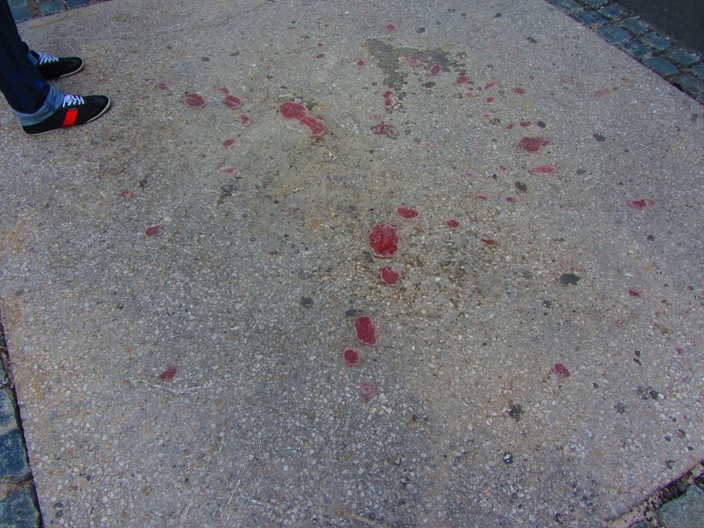 But just like in Mostar, the war left scars too obvious to ignore. Bullet holes, shells damage, buildings with placards of fallen victims names, were visible on most corners of the city. Later from one of the tour guides I heard that the damage in the buildings were not intentionally left bare, problem was the current government had not enough money to repair it all. Again, I felt like falling into war voyeurism, but since I was already knee-deep I guessed I just had to continue. 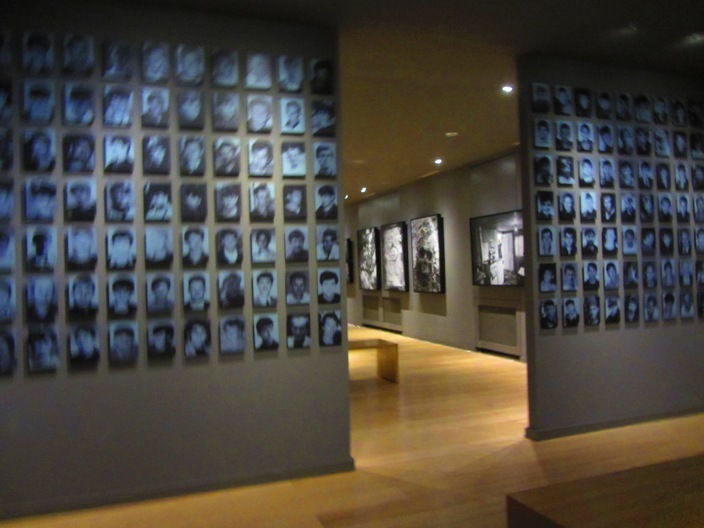 My first stop was the Galerija 11/07/95, a gallery to remember the Srebrenica tragedy. Visitors must pay 10 KM, no photograph was allowed, a very informative and moving guided tour was included. The gallery was small, with plenty of photographs and a couple of video shown in the screens. 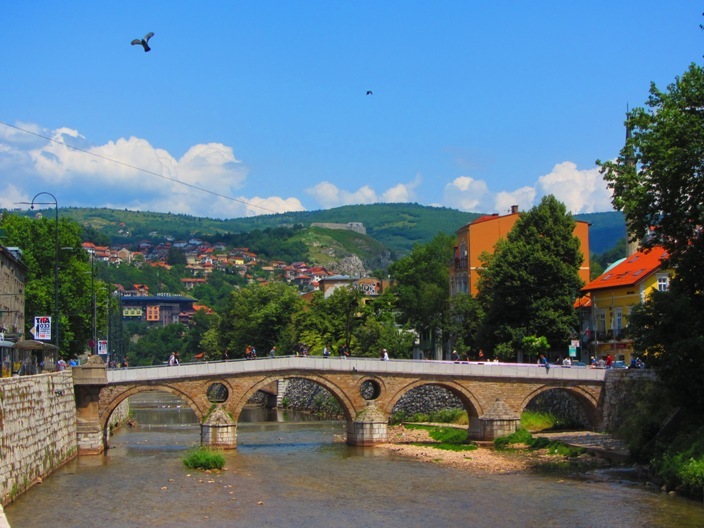 It is not a place that makes you happy, but I really recommend it to anyone visiting Sarajevo. I left almost in tears, feeling sad and wondering how could human beings be so cruel to other humans. But then again humans are the most dangerous of all animals roaming the earth, no? Only humans kill not out of necessity, eat when we’re not hungry, drink when we’re not thirsty, take things although we don’t really need it. Anyway. In the afternoon I took a “free” guided tour from Sarajevo Insider. By “free” it means participants are expected to tip the guide with whatever amount they see fit. The tour was short, around 1.5 hours, but packed with all necessary information for visitors. It started with a story of another war: the First World War, triggered by the assassination of Archduke Franz Ferdinand of Austria at the Latin Bridge in 1914. Then as we strolled into the Old Town, we stepped back in time into the Ottoman days. The streets and buildings were very Turkish, I felt like I was actually in Istanbul. In the Old Town, the guide proudly said, we could find mosques, Catholic church, Orthodox church, and a synagogue standing very near to each other. How ironic when we know later religion become one of the identities that pulled Yugoslavia apart. Along the way, the guide showed us the Sarajevo Roses, now decreasing in numbers as new asphalt was laid down on the streets. 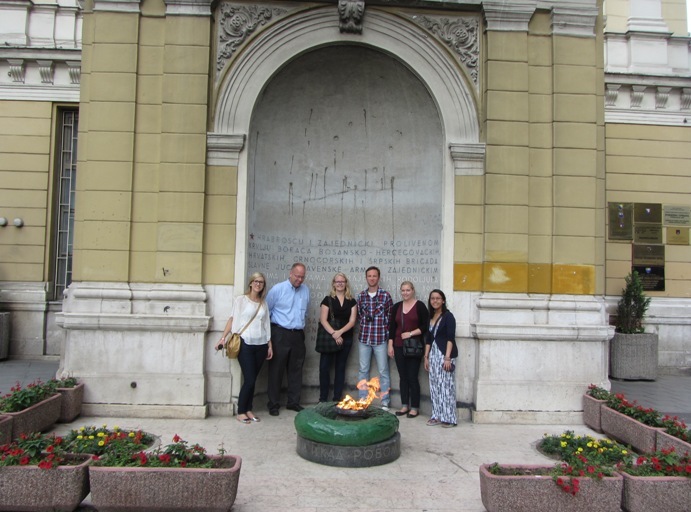 We took a group photo next to the eternal flame, a memorial to the military and civilian victims of the Second World War. She also explained about the complicated government structure produced by the Dayton Agreement. She believed the structure, which split the country into Republika Srpska and Federation of Bosnia and Herzegovina, hampered reconciliation as people from different ethnics tend to avoid each other. The presidency system, consisting of three people from each ethnic: Bosniak, Serb, and Croat; further complicates governance process and most of the time causes deadlocks in all public sectors. The presidency system was also considered discriminatory because minorities like Jews and Romas can not sit in it. Peace might have come to the city and the country, but they have a long way to go to be properly healed and to prosper. I can only pray for their future.